those fleeing from stress and the hassle of everyday life. On the island of Cavallo, the most beautiful of the Lavezzi archipelago belonging to Corsica, there is the Hôtel & Spa Des Pêcheurs. This is one of the most exclusive in the Mediterranean, dominated by the vegetation enriched with the fragrances of laurel, myrtle and juniper, and white and pristine beautiful beaches. The island, which is large approx. 1 square km, lies near the Straits of Bonifacio, approx. 15 km from the coast of Sardinia (8 nautical miles) and nearly 4 km from Cape Sperone, the southernmost tip of Corsica. 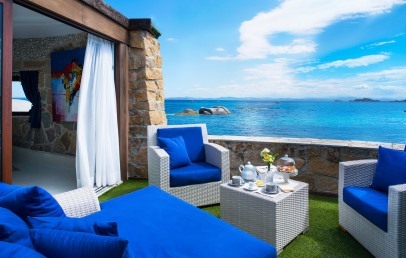 The hotel is accessible from the major European cities, arriving at the airports of Ajaccio, Bastia and Figari as regards Corsica and the airport of Olbia the nearest airport in Sardinia. The hotel is reachable with the hotel's private boat or a public service from the port of Piantarella (Corsica). If you arrive in Sardinia, the hotel will organize the transfer (approx. 25 minutes) from Santa Teresa Gallura. Built directly by the sea, perfectly integrated between the Mediterranean sea and the rocks shaped by wind and water, the Hôtel & Spa Des Pêcheurs is a four-star luxury hotel founded in 1991 and designed by the architect Roberta Valle. It is the only hotel on the island of Cavallo, a property where privacy and relaxation are guaranteed even for the most demanding customers who probably choose to stay here for just these reasons. On the island it is possible to circulate only with bicycles and electric cars to help maintain the environment pure and wild. It is an oasis surrounded by the vegetation facing the clear waters of the sea that turns a simple holiday in a unique and unforgettable experience. It is a paradise for those wishing to spend a wonderful holiday in contact with the sea, maybe practicing snorkelling or for those who wish to diversify their days practicing sports such as tennis, golf and horse riding. Among the proposed activities of the Hôtel & Spa Des Pêcheurs there is a wellness centre that offers the most advanced beauty treatments, thalassotherapy and relaxation massages. The Hôtel & Spa Des Pêcheurs has 50 rooms. Each one is equipped with all modern comforts such as satellite TV, Wi-Fi connection guaranteed in the common areas (Spa, reception, Shore Club), safety box, minibar and a beautiful terrace overlooking the crystal waters of the bays that surround the hotel. Standard (singles and doubles rooms) have an area between 20-25 sq.m. and a sea or garden view. Privilege (single, double and triple rooms) have an area between 35-45 sq.m. and the a beautiful view of the bay in front of the hotel. The only Suite of the hotel can accommodate up to four people, has an area of 120 sq.m. 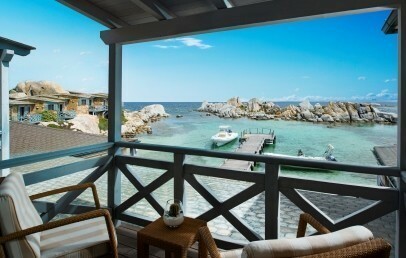 and a fantastic fully equipped private balcony from which you can enjoy a breathtaking view of the Lavezzi archipelago. The hotel has a private beach. The only equipped beach on the island with bar service, sun loungers and beach towels. Beach umbrellas are not allowed on any of the island's beaches. The beach service is included during the stay. At the SPA of the Hôtel & Spa Des Pêcheurs relaxation is guaranteed. The treatments are constantly being updated and are performed by highly qualified personnel able to develop customized programs. Some of the treatments can be made in the privacy of their room. The spa also has a thalassotherapy pool, sauna and a fitness center. The excellent restaurant of the Hôtel & Spa Des Pêcheurs offers daily fresh fish and Italian, French and international traditional dishes, masterfully prepared by the chef and that the guests can enjoy at the panoramic terrace tables. At the bar you can enjoy cocktails and other drinks while listening to the piano bar music, admiring the play of lights reflecting on the rocks the colours of the sea. Among the activities that you can practice in this corner of paradise, the Hôtel & Spa Des Pêcheurs offers tennis, golf, deep sea fishing, diving or boat excursions. Important to know – on the island Cavallo are no ATMs. It is therefore advisable to withdraw money at the airport, before arriving at the hotel. City tax – € 1,00 per person per overnight (included). Double or single rooms, with a third additional bed on request. 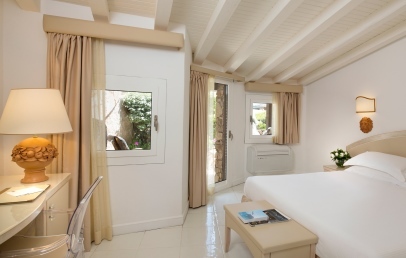 Blue and beige are the dominant colours of the accommodations, decorated with care and elegance. Each one offers privacy and quiet and is equipped with all modern comforts. The private bathroom has a shower or a bathtub. 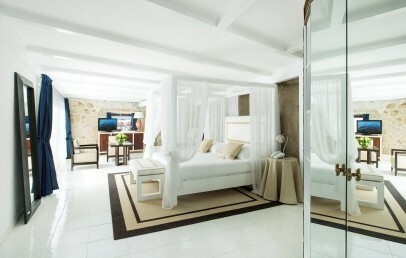 The Privilege rooms have a panoramic view of the beautiful Mediterranean sea. The only Suite of the hotel, with four-poster bed and can accommodate up to four people. 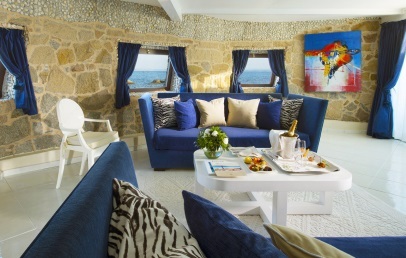 Blue and beige are the dominant colours of the Suite, decorated with the typical island rock and characterized by care and elegance. It offers privacy and quiet and is equipped with all modern comforts. The private bathroom has a shower and a bathtub. 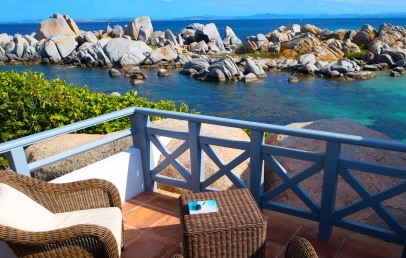 You can enjoy a breathtaking view of the Lavezzi archipelago from the fantastic fully equipped private balcony. Double or single rooms, all slightly different from each other in details. 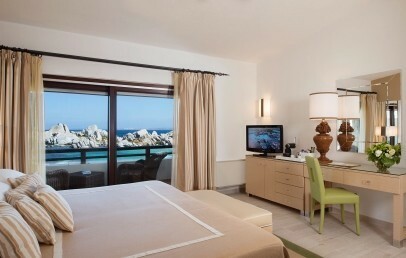 Blue and beige are the dominant colours of the accommodations, decorated with care and elegance. Each one offers privacy and quiet and is equipped with all modern comforts. The private bathroom has a shower or a bathtub. The rooms have a balcony with sea view. The standard rooms have an average surface area of 18 sqm. Welcoming and comfortable, they are available as double rooms (also for single use). 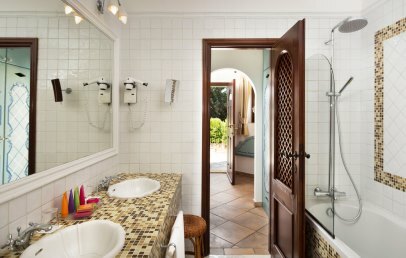 They are decorated with care to offer guests the possibility of making the most of their stay on the Island of Cavallo. Early Booking Non-refundable - Book within April 30th 2019 and get a 10% reduction (stays from August 1st to 24th)! The Early Booking rate is a non-refundable one and the total amount of the stay is to be paid upon confirmation. Early Booking Non-refundable - Book within April 30th 2019 and get a 15% discount on your stay (minimum 2 nights during the weekend)! The Early Booking rate is a non-refundable one and the total amount of the stay is to be paid upon confirmation. Early Booking Non-refundable - Book within April 30th 2019 and get a 15% discount on your stay! The Early Booking rate is a non-refundable one and the total amount of the stay is to be paid upon confirmation.